It is the end of summer. Holidaymakers are leaving Alexandria. The city is regaining part of its quiet. And Mohamed Adel El-Dessouki, an architect and conservation campaigner, is again on the road taking pictures of and drawing selected items of his city’s architectural heritage that he says “is being lost by the year”. At a café annexed to a large building that was built in reminiscence of an “old chic hotel”, El-Dessouki is putting down his tablet. He is going through a collection of pictures of early 20th century buildings in Alexandria that he has been trying with a group of other architects to put on a list of architectural heritage worthy of preservation. Some of these are apartment buildings on the Alexandria Corniche. Others are scattered around the city. “These are mostly buildings built in the early decades of the 20th century. We have tried very hard to include as many of them as possible in a list first put forward in the 1990s, and later enlarged, but we failed,” El-Dessouki said. El-Dessouki acknowledges the fact that it would be impossible to include all the architectural items which survived “the endless waves of erosion that the city has known throughout the second half of the 20th century, especially during the last two decades, and the years of the 21st century”. “It is a complicated issue really. Demolition is not just an act of owners and developers who seek to make maximum profit, so they take down a villa to build a twin-tower. 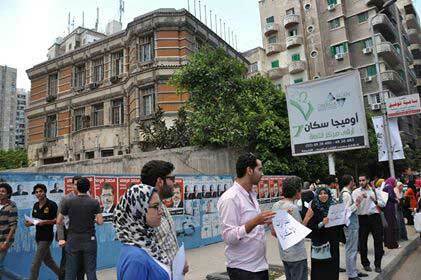 Demolition is also an act of failure to maintain the buildings against the environment and man-made signs of decay,” El-Dessouki said. “This is not just about a lack of funds, although this is increasingly a factor. It is also about a lack of interest in keeping the buildings,” he added. 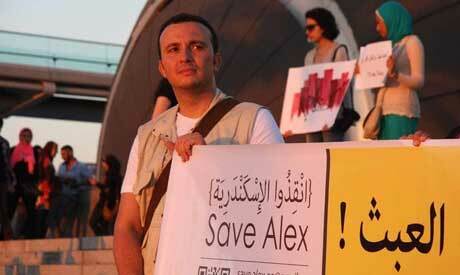 A member of “Save Alex”, a group of volunteers — mostly architects of the harbour city — who have been lobbying for the preservation of the city’s architectural and environmental heritage, El-Dessouki is coming to terms with the reality that the aggressive wave of demolitions the city has seen in the past decade is likely to continue. He is hoping, however, that some buildings can be saved. “It would not have been done without the people. The people would not act to protect a building if they did not feel an association to it,” he argued. “The writer Italo Calvino once wrote that the city ‘does not tell its past, but contains it like the lines of hand.’ This is basically the point: cutting people’s bonds with the past leaves the city with a discontinuous social narrative and a fragmented urban form,” El-Dessouki argued. Clearly, he added, architectural construction in place of the old is part of a city’s story. “It is inevitable,” he said. “Among many other losses, we cannot of course see the Pharos, the Seventh Wonder of the Ancient World. We cannot actually locate the ancient Museon or the Bibliotheca of the Ptolemaic city. We cannot see many of the modern monuments of the cosmopolitan city, such as the Royal Stock Exchange (La Bourse), Teatro Zizinia, or the original San Stefano Hotel and casino,” he stated. “Urban spaces are tangible collectives that are replete with intangible meanings and it is upon social groups’ interaction with these spaces that their fate is decided. This interaction is actually decided by the collective memories that people share and maybe cherish,” he argued. Last year, Save Alex held a photography contest under the name of “A building I love.” The objective was to encourage people, mostly young men and women, to document buildings that they relate to in one way or the other. “There has to be a connect between the people and the buildings if we wish for the people to really defend these buildings,” he argued. In a sense, El-Dessouki acknowledges that a good part of the loss of modern architectural heritage goes back to the disconnect between the people and the city’s gems in the wake of the 1952 Revolution. “I am not exempting the municipal authorities, or the absence of strict legislation, but I am just saying it is not just about those,” he said. 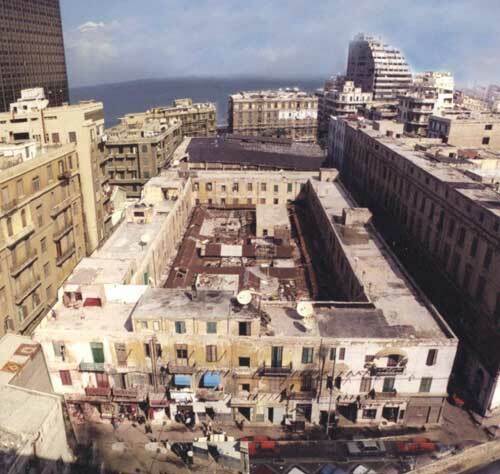 Ultimately, El-Dessouki argued, even with adequate legislation and public pressure, some architectural pieces, like the villas Aghion, Ambron and Cicurel, have almost all been lost. 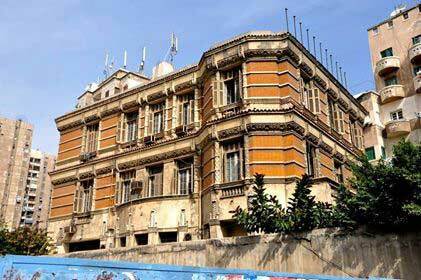 Today, Villa El-Kirdani, an early 20th century building, is being demolished. “The concept of reuse is basic when it comes to conservation. It has been successfully applied at a limited scale, in Alexandria and elsewhere across the country, and it worked,” El-Dessouki said. One example that El-Dessouki has in his collection of photos, and that he has for years been exploring, is the late 19th century building of Al-Souq Al-Franssawy. “This is basically a three-floor building that was fashioned like a typical Islamic wikala, with the ground floor serving commercial purposes while the second and third floor are for residential services. This was the original scheme. Across the decades, the building, which has a unique venue at the heart of Menshiya and which has unmistakable artistic merit, was turned, essentially, into a storage area,” El-Dessouki said. According to El-Dessouki, the way for this building to survive is for its use to be reconceptualised. “There are so many ideas, but one obvious idea is to turn it into a venue for the Alexandria Biennale,” he suggested. Meanwhile, El-Dessouki has already taken ample photos of this building and used the virtual reality technologies to reassemble its glory. For him, this is the start of a project that he hopes would include many other buildings constituting the city’s architectural legacy. “In the absence of a trustworthy preservation strategy we are bound to lose more buildings, so let us at least keep a memory of them,” he said. Almost 100 years ago, in 1919, El-Dessouki said, Hermann Thiersch drew the picture of the Alexandria Lighthouse that we know today. “What Thiersch did was inspired by readings and some drawings, because he never saw the actual building” that had suffered the ripples of several earthquakes before it was fully destroyed in the 15th century when Mamluke ruler Al-Sharaf QaitBey used the reminder of the stone to build his fortress. With the help of advanced technologies and the findings of archaeological excavations, El-Dessouki said, there are plans for a new image of the lighthouse to be released next year. “They are working on it and it is to be released on the 100th anniversary of the first picture. It is also expected to come with some virtual reality art,” he said. According to El-Dessouki, if the lighthouse could be reassembled centuries after its disappearance, then clearly the Alexandria of the last century could be partially reassembled, notwithstanding campaigns to preserve what remains.